Have you ever looked at a problem and thought to yourself, “This will be easy, I just need to do this and that and it’ll be done”? I often look at the broader problem without giving the details much thought until I’m already waist deep in code, and working on BOCO was no different. I was recently approached by Binary Cocoa to work on their newest game, BOCO. BOCO is a simple strategy board game where you try to fill a game board with coloured pieces to encircle your opponent’s pieces. You can encircle just one, or several pieces to win. The board is a simple grid of triangles, squares, and rectangles. Conceptually, this sounds like a pretty simple game to implement. The catch is that a player can only play their piece adjacent to other played pieces. This complicates things. My first attempt at mocking up BOCO ended up being very fragile. I quickly threw together a demo and while it worked, it wasn’t extendable in any way. Instead of hardcoding the grid and which shapes were neighbouring others, I needed a more elegant solution that wouldn’t fall apart if we want to expand the game. 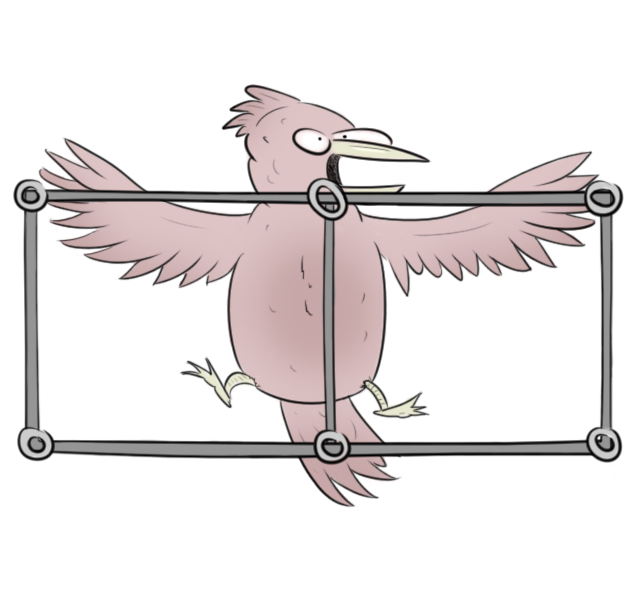 After some extensive research, I found the perfect solution: the Winged Edge Data Structure. 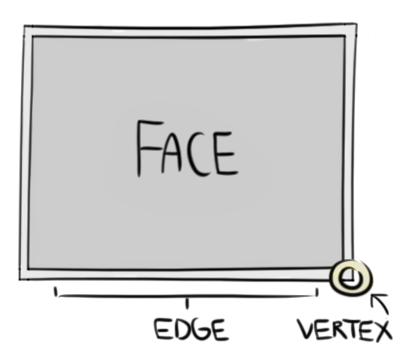 Winged Edge is a data structure that gives each vertex, edge, and face of an object descriptive information about the the other vertices, edges, and faces neighbouring them. What this means in layman terms is that each piece of an object knows which other pieces are connected to it. As you can imagine, this is an incredibly useful data structure and fits perfectly with my needs. Using Winged Edge, I could determine both where a player can put their piece, and if a player wins or loses. There was one problem, though. No one had bothered to implement Winged Edge using Lua, the language I was using to write BOCO. Before I could begin working on BOCO, I needed to write a Winged Edge library. My Winged Edge library, aptly named “Lua Winged Edge”, is a pure Lua implementation of the Winged Edge Data Structure. Any program or game engine that uses Lua can use this library. I’ve also licensed it under the MIT license which allows anyone to use, modify, and distribute both personally and commercially without royalties. The only stipulation is that the original license file remains in tact. I wrote a quick and dirty Wavefront Object Loader in Lua that would parse an object file and spit out a formatted table. This loader is again written in pure Lua and all of the above licensing information applies. I am a huge fan of open source software, and try to do my part to provide useful tools where there are none. 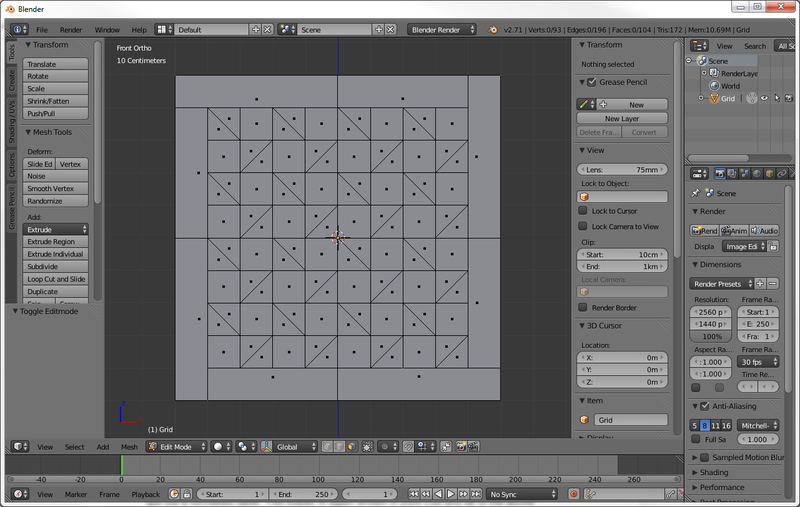 By using this loader, I was able to quickly mock up BOCO’s game board using Blender, a free, open source 3D modeling suite. Now that we have our Winged Edge structure set up, what can we do with it? Well, let’s say a player clicks on a tile in a grid to play their piece on the board. We need to know if the play was valid or not. How do we do that? First, we must triangulate each tile to break it down from any shape into a bunch of triangles. Next we cast a ray where the player clicked on the screen and check each tile to see if the ray intersects a triangle. Once we get our intersection, we know which tile was clicked. We can then run our validation check against that tile to ensure the play is valid. The validation check is very simple, we must ensure that the tile is adjacent to a tile that has already been played. What we do here is traverse through the clicked tile’s edges and check each edge to see which other tile it is connected to. If that tile is has already been played at some point, the move is valid. Now that we have our valid move, we must check to see if the player has won (or lost!). The win/lose checks use recursion to propagate outward from the clicked tile to check if it has encircled the enemy, or is encircled by the enemy. This code might be a bit difficult to understand if you are not familiar with recursive functions, but the gist of it is that you start with the clicked tile, you check each adjacent tile to see if it pas been played and by whom. If the tile has been played by your enemy, you call the function on itself with the new tile and keep branching outward. Once a recursive branch hits one of your own tiles, you know that you’ve reached a point where you might have encircled the enemy’s tiles so you start unraveling the recursion and send that data back. If at any point you find a tile that has not been played yet, you know that it is impossible that encirclement could have happened and we just kill the whole process. In the end, loading the game board from an object file and using Winged Edge to manage the whole game was absolutely the right choice. BOCO’s code is in a state where we could potentially add new game boards with different tile shapes without needing to adjust a single line of code. Creating new game boards in Blender takes minutes instead of hours allowing for quick and simple testing of new board designs and new strategies. Developing BOCO was a surprising yet fun challenge and working with the Binary Cocoa team has been a privilege.